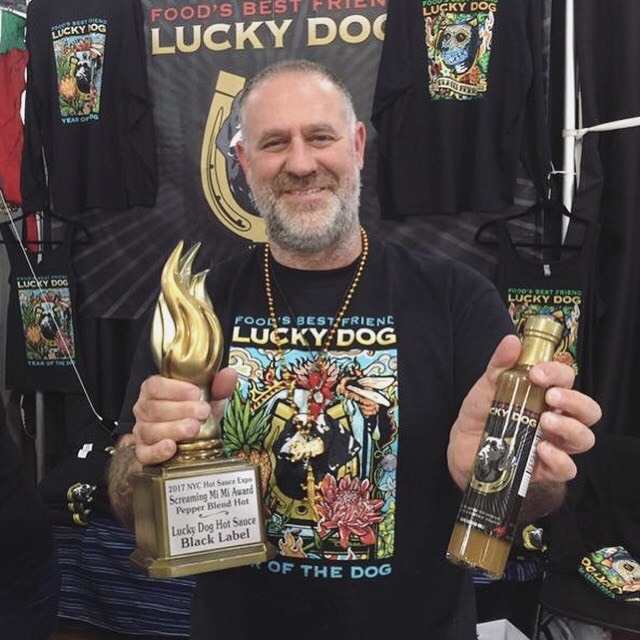 Scott Zalkind, the mastermind behind Lucky Dog Hot Sauce, won another award this weekend and we’re pleased to be part of the team that got him there! The 2017 New York Hot Sauce Expo awarded the Screaming Mi Mi Award to Lucky Dog Black Label. Thanks! There are 13 screaming Mimi’s, making this one of, of not the hardest award to win in the hot sauce industry. Winning the Pepper Blend category is especially exciting, as this was a category I’d previously won with Brown Label in 2015, and because it’s consistently the most populated category. Super proud of the award and thankful to the consistent quality from Village Green!